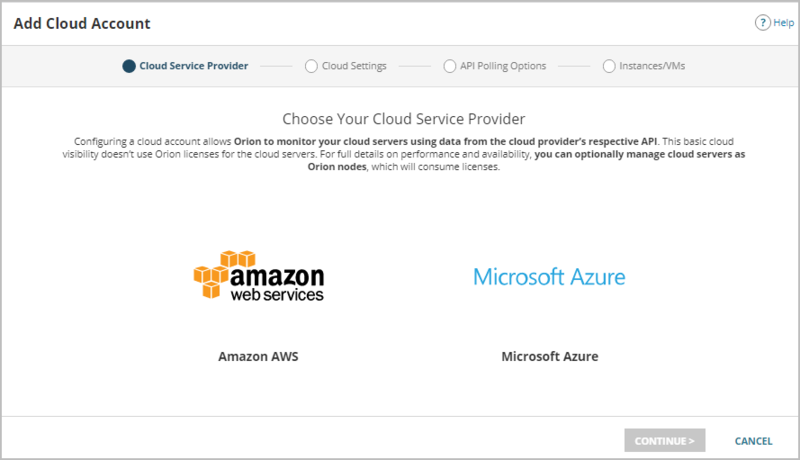 To get started with cloud monitoring, add a cloud account to the Orion Platform. Before proceeding, make sure the cloud account is configured for the Orion Platform. Be sure to have your cloud account credentials handy. Log into the Orion Web Console. Click My Dashboards > Cloud to access the Cloud Summary page. In the Getting Started resource, click Monitor my Cloud Instances. Select a Cloud Service Provider. Click Monitor AWS or Monitor Azure, depending on which provider you selected. On the Cloud Settings tab, enter a Display Name for the account and provide account credentials. If the SolarWinds Orion server requires a proxy server to connect to certain websites, click "Are you behind a proxy?" to configure proxy settings. If an error occurs, verify account credentials and confirm that accounts are configured for the Orion Platform. (Optional) Toggle Auto Monitoring off for instances/VMs added later, either manually or via automated discovery. Click Continue to complete the wizard. To learn more about wizard options, see Add a Cloud Account. After an account is added, the Orion Platform begins polling for data. Click Dashboards > Cloud to display the Cloud Summary page and review instances/VMs for the new account. If necessary, you can restrict other Orion Web Console users from displaying instances/VMs for an account. 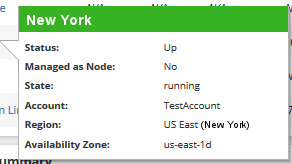 Hover over the name of a cloud instance/VM to display more details about it. 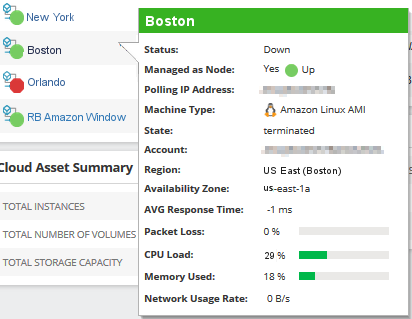 If an instance/VM is a managed node, additional data, such as CPU usage and packet loss, displays. The Cloud Summary page displays a variety of data. Use the Search Instances field to find instances/VMs and volumes quickly. Click hyperlinks to access more details quickly. Hover over points to compare collected data and linked alerts. The Cloud Instances Status Summary shows various metrics. Values that exceed thresholds are colored to indicate warning (orange) and critical (red) values. The Cloud Asset Summary displays totals for instances/VMs, attached volumes, and storage capacity, grouped by cloud service provider. The Cloud Server Infrastructure section groups instances/VMs by cloud account and region. The Active Cloud Alerts section lists unacknowledged alerts currently affecting cloud instances/VMs. The Cloud Applications with Problems section lists applications with issues on cloud instances managed as nodes in SAM. The Cloud Volumes Performance section includes various volume-related metrics. 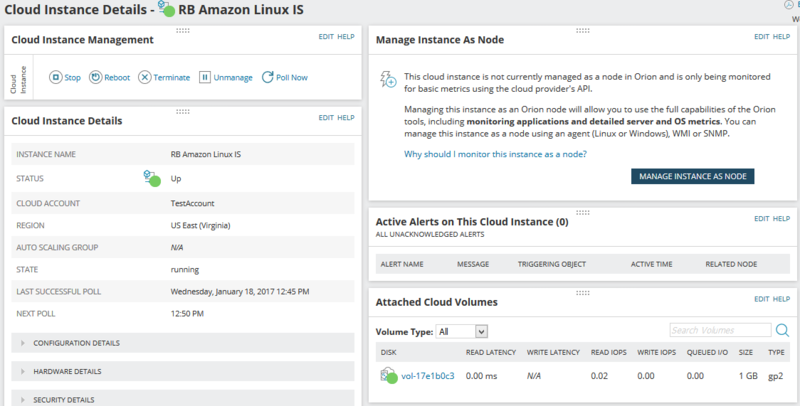 Active Alerts lists active alerts affecting the cloud instance. Min/Max/Average of Average CPU load displays average CPU load collected and calculated for the cloud instance. Min/Max/Average of Network Utilization provides a chart of the minimum, maximum, and average bits per second transmitted and received over a cloud instance for a custom period of time.